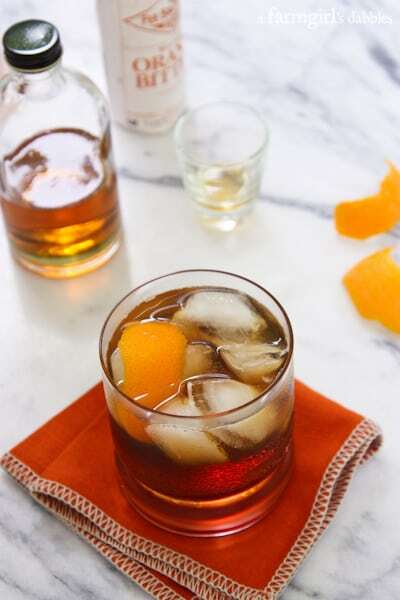 I am so excited to share this Bacon Bourbon Old Fashioned with you! It’s a wonderful little bevvy, strong yet smooth and a little bit sweet, that I’ve wanted to replicate since I visited Nantucket last fall with the National Pork Board for the 2013 Pork Crawl. So when the National Pork Board asked me if I’d share with my readers my own personal #PorkBucketList, a dream list of ways I’d love to experience pork in new ways, it took me all of two seconds to come up with the first item I wanted to tackle. You guessed it. My mouth was watering, waiting to infuse a bottle of bourbon with the awesomeness of bacon. 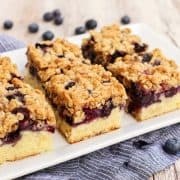 You have to check out this recipe at the end of this post, courtesy of the Boarding House in Nantucket. 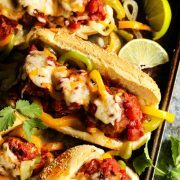 And you simply have to read to the end of this post to see what’s on my #PorkBucketList and to learn how you could WIN $500 to check off an item from your own pork adventure dreams. By sharing what’s on your own #PorkBucketList in the comments section of the giveaway, and online via Twitter, Pinterest, or Instagram using the hashtags #PorkBucketList and #promo, you can be entered to win this awesome prize! My trip to Nantucket last year to attend the Pork Crawl ranks extremely high on my list of awesomely cool places I’ve been, things I’ve done. The location, the people, the food. It was an experience I’ll never forget. It was the ultimate item for a #PorkBucketList, for sure! I always knew that pork was extremely versatile in its preparation and flavoring, but walking through the Pork Crawl and eating several pork dishes at each of the nine restaurants in one glorious fall afternoon…well, I’ll just say my world of pork was opened up even wider. 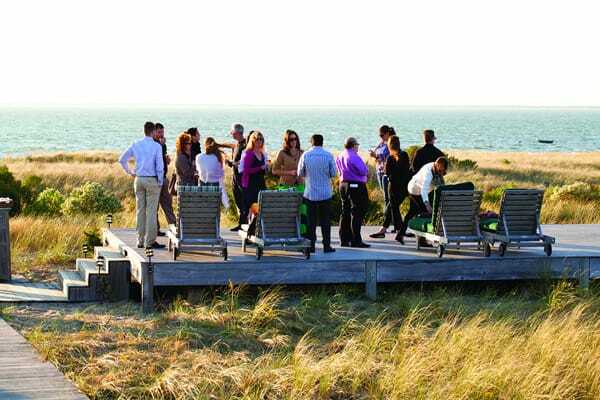 See my recap for a little Nantucket scenery in autumn, plus a whole lot of fun and inspiring pork dishes. Also be sure to check out the National Pork Board’s video. It’s such a great summary of the time we spent together on the Pork Crawl. I had nothing but admiration for the dedication of the National Pork Board and the Nantucket restaurant owners and chefs. They were bent on spreading the good word about pork. And I had nothing but awe for the island and town of Nantucket. Imagine sipping chilled bubbly at sunset, nibbling on exquisite little pork appetizers, plus oysters harvested just 300 yards off the harbor, on the pristine beachfront of The Wauwinet. I pinch myself. It feels like something from a dream. If I could only recreate every other wonderful pork dish from the Pork Crawl, in the same fashion, I’d be one very happy girl with a very happy family. 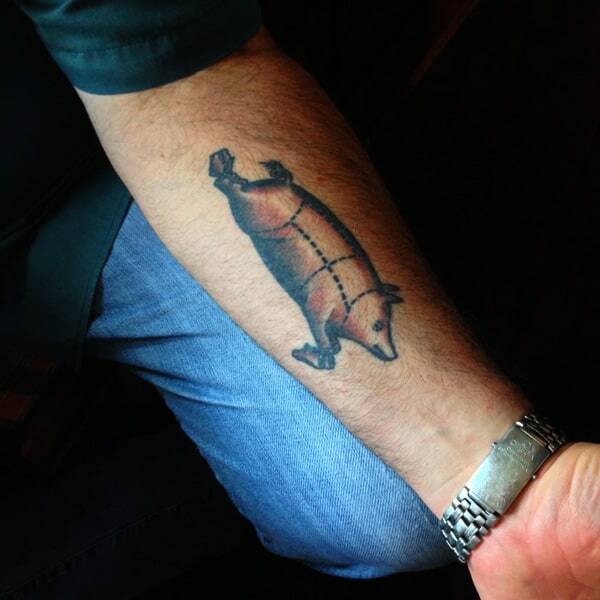 We all love pork. If you check out my recap, you’ll see all nine restaurants from the Pork Crawl, highlighting their pork creations. 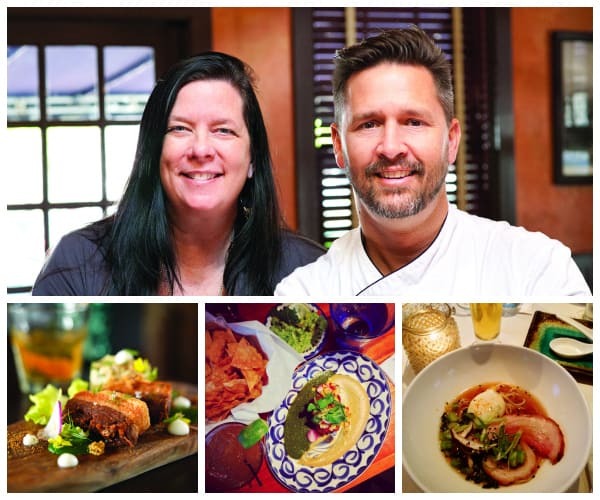 Today I am focusing on Chef Seth Raynor and his wife Angela, co-owners of three very different and very awesome restaurants in Nantucket. Their restaurants hold the rights to a few of my favorite dishes from the Crawl. I love how these three dishes showcase the versatility of pork from cuisines around the globe. Experiencing any (all?!) of these three amazing dishes would be a fabulous addition to anyone’s #PorkBucketList! While at Chef Raynor’s Boarding House, I ventured a new way with pork with my first bacon infused beverage. Quite candidly, I was skeptical when I first saw that drink listed on the little menu card when I sat down at the table. But one sip was all it took to draw me in to that house infused bacon bourbon old fashioned. The National Pork Board is having so much fun right now with their #PorkBucketList! They asked me to share items from my own #PorkBucketList, and then to ask you to do the same. By using the hashtags #PorkBucketList and #promo, we’ll all then be able to access everyone’s delicious pork inspiration at PorkBucketList.com. I’m excited to see what this will become! So here goes. Here’s my #PorkBucketList, a collection of pork deliciousness that I’d love to see come to reality! Take a class to learn more about charcuterie. And eat it while I’m learning about it! Share an over-the-top pork meal with my husband at Butcher & the Boar, one of our favorite Twin Cities restaurants. Make pork hocks and sour kraut, like I remember Mom doing when I was a kid. Take in the bo ssäm pork shoulder experience at momofuku ssäm bar in New York City. And now it’s YOUR turn. I want to hear what’s on YOUR #PorkBucketList. What pork dish have you been wanting to create in your own kitchen, or where have you been wanting to travel to experience pork in a brand new way? I want to know! 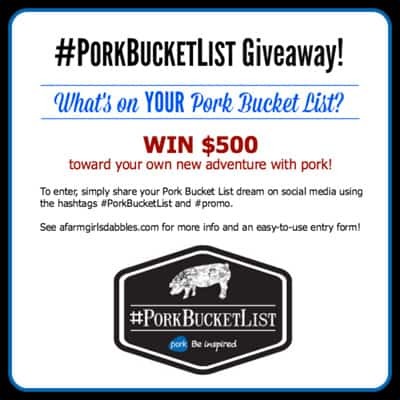 By sharing what’s on your own #PorkBucketList in the comments section of the giveaway, and online via Twitter, Pinterest, or Instagram using the hashtags #PorkBucketList and #promo, you can be entered to WIN $500 to put toward checking off your own new adventure in pork. Also be sure to check out other people’s lists at PorkBucketList.com. Isn’t that just too cool?! Just head over here to enter, and to read the terms and conditions. 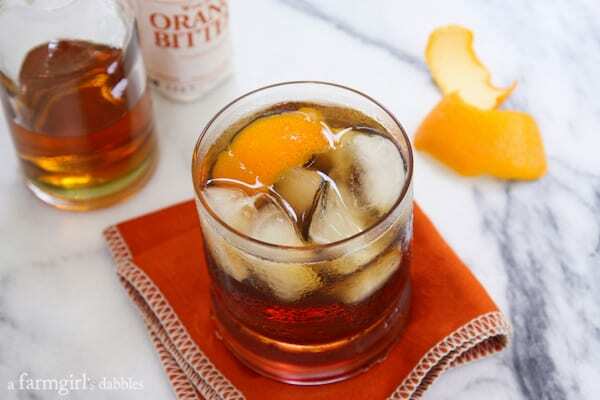 And then grab the recipe below and make yourself one of these old fashioneds. I love how the subtle sweetness of the maple syrup and orange bitters plays with the hint of smoky bacon in this drink. Even my husband, the straight-up drinks sort of guy who doesn’t want any amount of sweetness in his cocktail glass, likes this bevvy. I’d take that as a serious compliment to this drink if I were you! In a cocktail shaker, combine bacon bourbon, maple syrup, a few dashes of bitters, and ice. Shake and strain into a rocks glass. If desired, fill glass with ice first. Garnish with an orange peel. In a medium non-porous bowl or pot (big enough to hold the bourbon) with a lid, combine bacon fat and bourbon. Cover and let stand at room temperature for 6 hours. Place in freezer overnight. Strain liquid from solids using a double layer of cheesecloth set over a colander. Reserve bourbon and pour back into original bourbon bottle or other bottle of your choice. Discard cheesecloth with bacon fat. 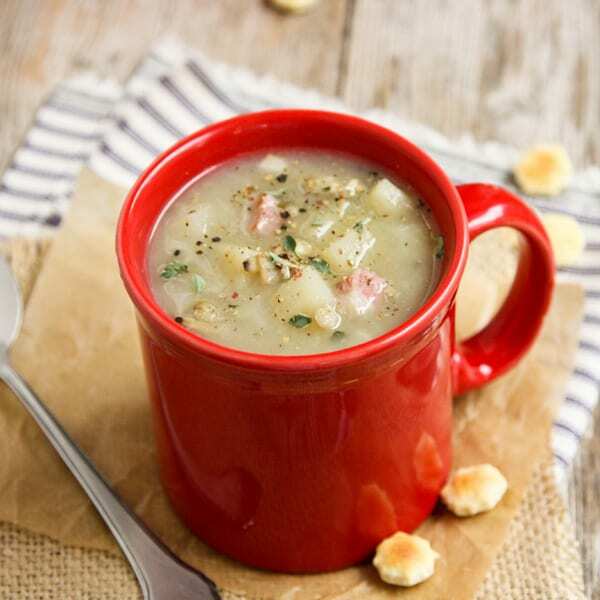 Recipe adapted slightly from Chef Seth Raynor at the Boarding House in Nantucket, MA. 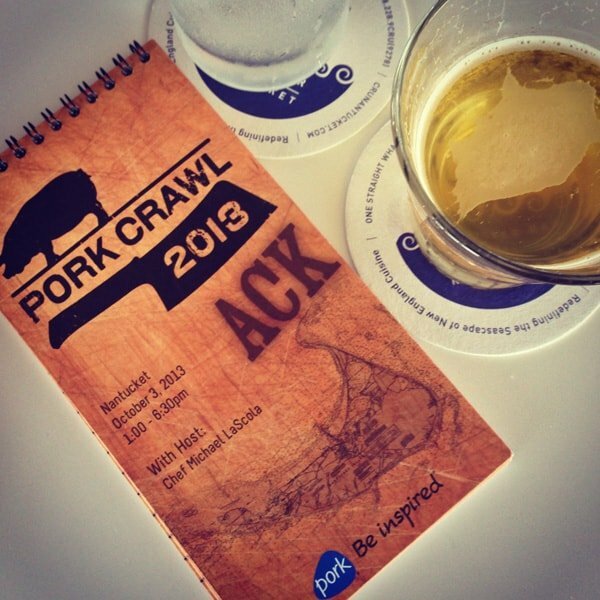 I enjoyed this bevvy while on the 2013 Pork Crawl in Nantucket with the National Pork Board. Disclaimer: This blog post is sponsored by the National Pork Board. All opinions are my own. Thank you for supporting the brands I love that help make this site possible! I’m looking to start making this INCREDIBLE recipe this weekend. Just looking for a quick clarification. By “bacon fat” are you referring to the left over oil you get from cooking bacon in a pan or actually cutting the cooked bacon fat off and adding that into the container with the bourbon? Many thanks! Hi George – cook the bacon and reserve the rendered fat. This process yields a very subtle smoky bacon essence. I found that using a very smoky bacon (I used “double smoked” from a very good local meat counter) works better. When I make this again, I might even experiment with placing a stick or two of cooked bacon into the jar, to squeeze more bacon flavor out of it. I’d love to hear what you do and how it turns out. Enjoy! 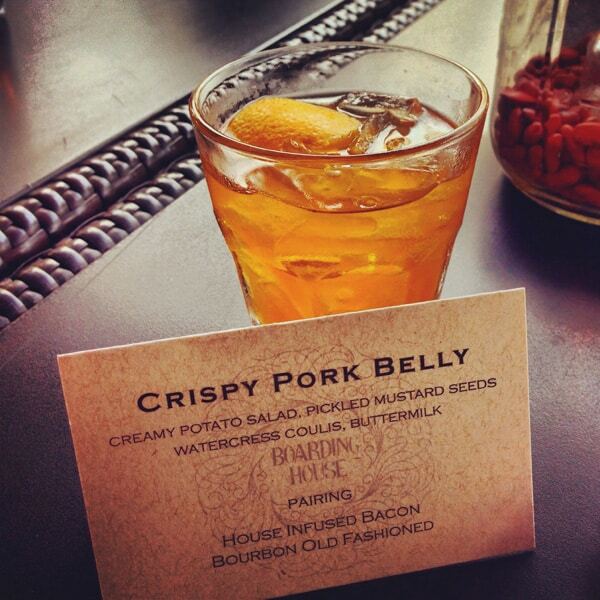 Bacon Bourbon just got added to MY #PorkBucketList… that’s for sure!!! What do you know? It’s almost 5 o’clock and we all know that bacon and bourbon make things a whole lot better! If I was a drinker … I’d drink this! What’s on my PorkBucketList? Roasting an entire pig! This has my name written all over it ! Gorgeous. And I can’t help but think that bourbon would make a killer Bloody Mary too! Love your bucket list! Can’t go wrong with The Butcher and the Boar. Pork Belly is at the top of my list and your old fashioned is at the top of my husbands! I wish I could bottle up the aroma of Butcher and the Boar. It is just so fabulous!! Love this cocktail! My personal pork bucket list includes making my own bacon. I’ve wanted to do it forever! 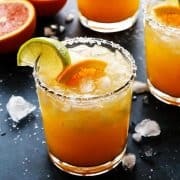 This cocktail sounds absolutely amazing! It would definitely be on my pork bucket list! These drinks look amazing! Your bucket list is a dream. I would love to take a charcuterie class too. That sounds awesome! How long does the bacon bourbon hold up? Does it go rancid because of the bacon infusion?? I’ve only had mine made for a few weeks, but it’s still good yet. 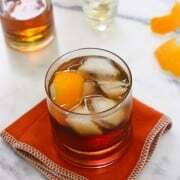 I definitely want to try the Bacon Bourbon Old Fashioned. It sounds amazing! Another thing on my bucket list, just not sure if there is one yet, is to go to a pork fest. It would have all sorts of “signature dishes” as well as anything pork, bacon, ribs, pork carnitas, ect. If there isn’t one, I think someone would start one…it would be amazing! Bacon does make everything better! I don’t drink, but, this looks good enough to make me start! This is the best cocktail I’ve seen in awhile! LOVE!! I’d like to try making some tacos we had at a restaurant that are crispy pork belly with pickled onions, green papaya jicama slaw & radish. This is like the best cocktail EVER!! My pork bucket list includes making some sort of amazing peach barbecue sauce to go with grilled pork chops. Looks awesome, Brenda! Fun for the weekend! This cocktail is all sorts of amazing! A must try!! Well, now I have to do bacon bourbon! !